This Hex2 has a very unique shape that I haven't seen before. When I first looked at it, I thought of one of those measuring devices they use in department stores to get your shoe size. Remember you'd pull out your nasty funky foot and stand on it while the poor sales lady would try not to make a face as she squished your foot in the device? The "Al Bundy" (we'll call it) has this shape for a couple reasons. First, they used it to pack more weight in the back corners, which in turn raises the driver's MOI. Higher MOI means the club won't twist as much on those off-center shots, and your slices won't slice as much. 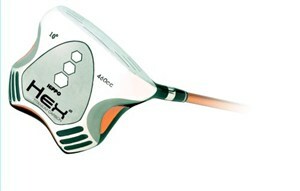 The other reason for the shape is to make the club more aerodynamic. With the big oversized clubhead, the only way to increase clubhead speed is to lessen the wind drag while you are wrapping it around your head and swinging for the fences. I can't say this is my favorite golf club in the world, but it is inexpensive. I'd buy this before I went to Wal-Mart and bought something there for the same price. If you are serious about buying a geometric driver that is forgiving and aerodynamic, then I would spend a little more money and grab either a TaylorMade Burner SuperFast Driver or an Adams Speedline Driver. The feel and performance are worth the extra money in this case.